Quality - This usually has to do with materials and the brand, though it is a culmination of a bunch of different aspects. Karambits have a long history, as as such, there’s a ton of knock-offs. We were actually shocked at how many different knives we had to dig through before shipping our final selection to be tested. Brand - Brand is big on quality and determining if it’s worth the money spent. The brand’s dedication to quality knives, mail order sharpening services and warranty policies are all going to take a part in your final decision. 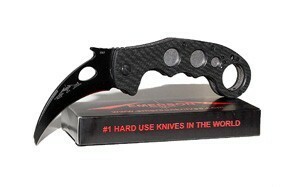 The karambit knife brand you go with actually makes a huge impact on the longevity of your product. Reviews - User reviews help us determine what’s going to be wroth our time before we make the purchase and get it shipped out. We went for a lot of knives that have a tall list of reviews that showcase the quality of the product. 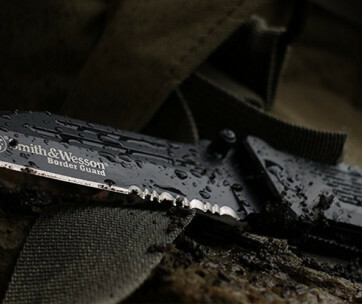 It’s the voice of the people, and it’s one of the best indicators you’ve got when it comes to grabbing the right knife. Price - Price always plays a part, but if you’re going for a quality karambit, it’s going to cost you a pretty penny. 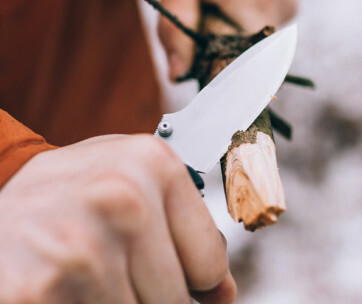 Since these are straight-cut narrow knives, the engineering and weight displacement aspects of your karambit are a lot more difficult to achieve, which is why quality brands charge more than you’d expect to see with straight knives. Blade Material - Most of the time, you’re going to encounter high-grade iron, stainless steel (sometimes surgical grade), or refined carbon. Karambits that are made out of less dense, less durable materials are easy to spot when you look at user reviews. Because of the curvature of the blade, you need a highly durable material, otherwise it’s going to buckle if you attempt to use it for any reason. Blade Length - We cover more in this guide about blade lengths and laws (as best we can), but the blade length is a major thing you need to be on the lookout for. Ensure that when you’re looking at the sales page for a karambit, that you take the blade length into consideration, not just the overall length. You could have a hilt that’s 14” long and not break any laws, but your local government may have different laws regarding the blade length. Handle - The handle has the protrusion ring, which helps for your grip, but also needs to have a good grip on its own along the materials and texture. Since the blade is already curved, there are a lot more ergonomic handles out there to ensure you have a steady grip. Protrusion Ring - This little number is part of what makes a karambit, a karambit, and not just a curved blade. You have plenty of historically-known blades that have curvatures along the sharpened edge, but the protrusion ring makes this unique. You’ll see in a video we posted blow that you’ll be able to do all sorts of martial arts tricks and moves with it. Look for the overall width so you know it’ll be a good fit for your fingers. 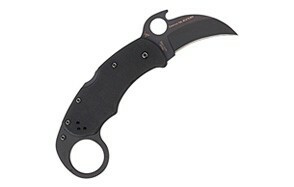 Fixed Blade Karambit - These don’t fold in like other types of karambits. The blade rests in the same spot, removing the foldable mechanism, which makes them better for martial arts due to the lessened chance of mishaps and/or cuts. 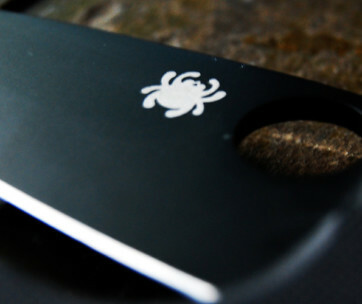 Fixed blades are usually not the go-to for hunters or fishermen looking to get use out of a karambit. 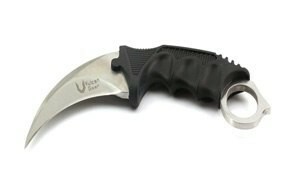 Manual Folding Karambit - Similar to your existing folding knife, these fold inside of the hilt for better storage, and work well as a self-defense weapon (so long as local laws allow). You won’t have any spring-loaded features with this, so you’ll have to master quick access and pulling back the clasp to release the blade. These aren’t to be used for martial arts as they’re slightly less reliable, and you’ll be pushing the limits of the clasp further than it should be. Butterfly Karambit - Similar to a switchblade, this opens right out of the top, but there’s a bit of a catch. Since the blade is still curved, making it a traditional karambit knife, you have to deal with the curvature as an obstacle when trying to open it. No-Slip Grip: Karambit knife manufacturers know just how dangerous these can be, and as such they put no-slip grips along their hilt. While it only helps so much if you’re doing martial arts, it still helps when you're holding it sturdy and handling it for various purposes.